Time to play: 15 minutes. Mike: This is the first of two filler reviews we have the second game –Crossing will be up next. A big thank you to Esdevium Games for our review copy. You can find your nearest game store using their handy store locator. 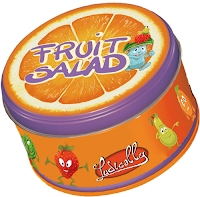 Fruit salad is a reaction and memory game for all the family. To me, it feels a bit like a cross between snap with the memory element of pairs. At the start of the game, the 60 cards are dealt out evenly to all players. With the aim of the game being to get rid of all your cards or win 4 rounds. David: The starting player rolls the 2 dice, one is a fruit type and the other is a number from 4 to 8. 5 Strawberries are needed to win. This tells everyone what fruit and how many of that fruit you need to keep track of. Players, in turn, each place a card from their hand into the centre of the table. This is called the salad bowl. David plays first and there are 2 strawberries. I go next and there are now 3 strawberries in the salad bowl. You need to remember what has been placed. When you believe the required number of fruit are in the bowl you slap your hand on top of the bowl, just like you would in a game of snap. Mike: Sounds simple right? Well, it would be if the goal didn’t change throughout the game. If any of these cards come out below you reroll the fruit or quantity dice. Left card re-roll quantity die. Right card re-roll fruit die. So you also need to be trying to keep a running count of how much of the other fruit has shown up in the salad bowl. Once you have stopped the round by placing your hand on the salad bowl you go through the cards counting up the fruit. If you are correct and the number of fruit on the fruit die is equal to or greater than the number on the quantity die you win the round. You take one of the cards from the fruit bowl and place it face up in front of you as a victory point token. All the remaining cards are dealt out to the other players. If you got it wrong you lose and take all the cards from the salad bowl into your hand. 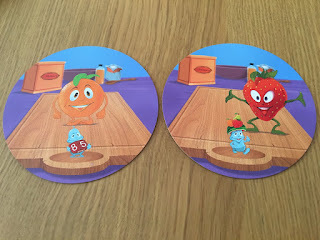 David: There is also an “any fruit” side to the dice which can be useful if it is rolled later in the game as it gives you a chance if you have forgotten some of the other fruit amounts. This game is simple but great fun. It is much better than snap as you have to think a bit more about the game and the way the goal changes keeps you guessing. Mike: That is quite simply all there is to this game. Which makes this a great filler game and fantastic for younger players who like card games. The rules mention a small rule change for younger players that lets them look at the card first before playing to give them a small advantage. I really like this idea as it can be a little difficult to remember the counts of all the fruits (even for adults). I was really surprised by this game. It sounds very simple and at its core it is, yet the changing goal during the game trips you up and keeps you on your toes throughout. 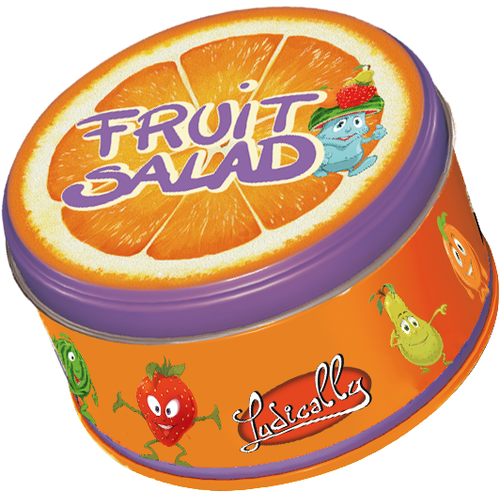 Fruit Salad is a welcome addition to our set of family games and another one at the top of our lists to take on our travels. The game comes in a nice small tin that looks like an old-fashioned sweet tin. Coming in at just under a tenner as well is a perfect price for a filler game and will give you hours of fun. David: This is a great introductory game for the family and is a very addictive. I would like to play this with my sister when she is a bit older it will be a perfect game to introduce her to memory card games. Mike: So there we go we both recommend it. If you’re looking for a filler game that can be played with kids, your family or a way to kick off a board game night we think this is for you.